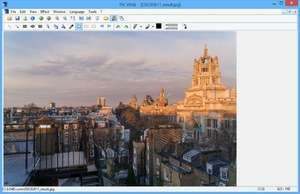 Alternate Pic View is an image viewer and manipulator which supports many common image formats including JPG, TGA and WMF, among others. The application interface is rather easy-to-use and includes access to a number of image modification tools from the menu bar including rotate, mirror, flip and color modification. It can also apply different filters to images like blur, sharpen, pixelate, noisify and others. Other basic drawing tools can also be used on images opened with Alternate Pic View such as shapes, arrows, text and drawing. Version 2.640 is a freeware program which does not have restrictions and it's free so it doesn't cost anything. For security reasons, you should also check out the Alternate Pic View download at LO4D.com which includes virus and malware tests. Additional screenshots of this application download may be available, too.